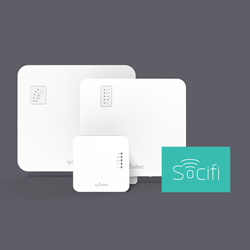 Now it is easier than ever to set up the SOCIFI on IgniteNet devices and monetize your Wi-Fi. IgniteNet and SOCIFI have collaborated to develop a simple application for IgniteNet devices. Now service providers can automatically configure the IgniteNet Wi-Fi devices for use with SOCIFI services. The application is free to download via IgniteNet’s Cloud controller. Installers will save significant amounts of time, as the application eliminates the needs to manually enter all of the captive portal settings. It also eliminates potential for human error, enabling installers to get more Wi-Fi hotspots up and running per day. Companies can easily control the service via SOCIFI's cloud based dashboard. It manages all access points, Premium (Pay-As-You-Go) Internet Access, Payment Gateway, Authentication & Authorization, Data Mining and Analytics. “We are really happy to see more and more technology partners integrated into our Cloud Controller marketplace, which has become very popular with Wi-Fi service providers. Our new SOCIFI APP enables network admins to configure SOCIFI on our devices in less than a minute each” – says IgniteNet VP of Marketing, Jonas Sabaliauskas. “We are pleased to be working with IgniteNet on native integration and adding benefits for IgniteNet WiFi service providers. All providers get a seamless solution for advanced network monetization and additional public safety (FEMA IPAWS) for their network users.” – says SOCIFI CEO, Sidney Zdenek Hornych. Headquartered in Irvine, CA, IgniteNet is a wholly owned subsidiary of SMC Networks, Inc. IgniteNet has a proven track record of producing powerful, reliable, and easy to deploy, innovative cloud managed wireless solutions and the industry's lowest cost 60 GHz wireless technology through channel partners worldwide focused on Enterprises and service providers.